FOUR-TIME TOUR de France winner Chris Froome should be suspended by his Sky team over an adverse drug test, according to world cycling chief David Lappartient. “Sky should suspend Froome. Now, it’s not up to me to interfere,” Frenchman Lappartient, the International Cycling Union (UCI) president, told French regional newspaper Le Telegramme. “Without wishing to comment on the rider’s guilt, it would be easier for everyone (were Sky to suspend him). “It’s up to (Sky team manager Dave) Brailsford to take his responsibilities. “Quite apart from that, I think that’s what the other riders want. Lappartient said that regardless of Froome’s innocence or guilt, until he is either exonerated or found to have broken the rules, fans will not give him the benefit of the doubt. “Whether the test result is abnormal or not, either naturally or fraudulently, it’s awful: in the eyes of the wider public he’s already guilty,” said the UCI chief, who claimed he found out about the test result an hour after being elected to his post over Briton Brian Cookson on 21 September. 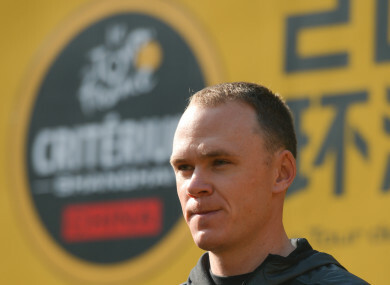 Regardless, Lappartient believes the affair will last a long time with the possibility of Froome appealing any eventual sanction to the Court of Arbitration for Sport. “It’s going to be a judicial battle that will last a long time. Some of Froome’s main rivals have hit out at cycling authorities for failing to ban the reigning Tour and Vuelta a Espana champion, who tested for elevated levels of the asthma medication salbutamol during his victory in Spain’s Grand Tour last September. Frenchman Romain Bardet described cycling as “a laughing stock” earlier this week over the affair. World time-trial champion Tom Dumoulin previously insisted his team, Sunweb, would have suspended him for a similar offence. Bardet even suggested that if Sky don’t suspend Froome, the rider himself should voluntarily “pull out” from racing “while waiting for the authorities to decide”. Lappartient said he would look into the issue of therapeutic use exemptions (TUE), which many believe have been abused to allow riders to get an unfair advantage from legally taking banned substances. The UCI president said he wanted to put in place “independent medical observation” that would prevent riders from competing if they’ve applied for and been granted a TUE. “That would allow us to solve the corticosteroids problem,” he added. In 2016 the Russian hacking group Fancy Bears revealed that Bradley Wiggins, the first Briton to win the Tour in 2012 before Froome emulated him a year later, had received three TUEs during his career at crucial moments: before the Tour in 2011 and 2012 and the Giro d’Italia in 2013. Wiggins claims he needed to take the corticosteroid triamcinolone to treat allergies but some ex-cyclists have spoken out against that claiming it would have given him a significant performance boost. Email “'Sky should suspend Froome... That's what the other riders want'”. Feedback on “'Sky should suspend Froome... That's what the other riders want'”.